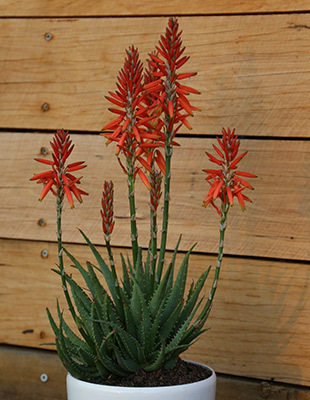 Description: Mighty Orange™ Aloe is a medium sized variety succulent plant. 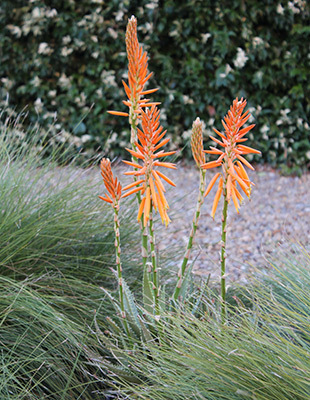 It has bright orange flowers in winter and is tough. 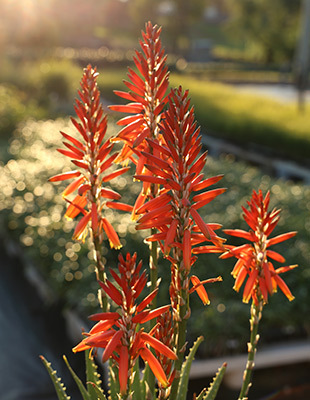 It is frost tolerant and has excellent drought tolerance. Size: 70cm high x 70cm wide foliage; 1.2m high flowers. Uses: Feature plantings, rockeries and along fences. Position: Full sun to part shade. Drought and frost tolerant. Works with most soil types, but if in clay soils, try to improve drainage or use in a raised garden. Care: Water as required for 8-13 weeks until established. Plant in a well mulched garden (chunky mulch is recommended). Fertilise yearly with slow release fertiliser. Cut back spent flowers if desired. Where it works: South QLD (raised gardens and free draining soil), NSW, VIC, TAS, SA, WA & ACT (requires further testing here).